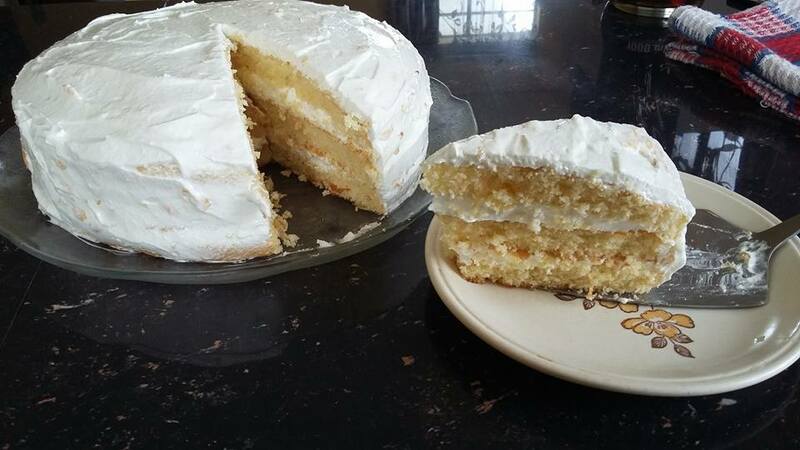 Zee Monodee: Coconut Quick-Mix Yellow Cake with Marshmallow Frosting - All #Homemade! NO #Chemicals! 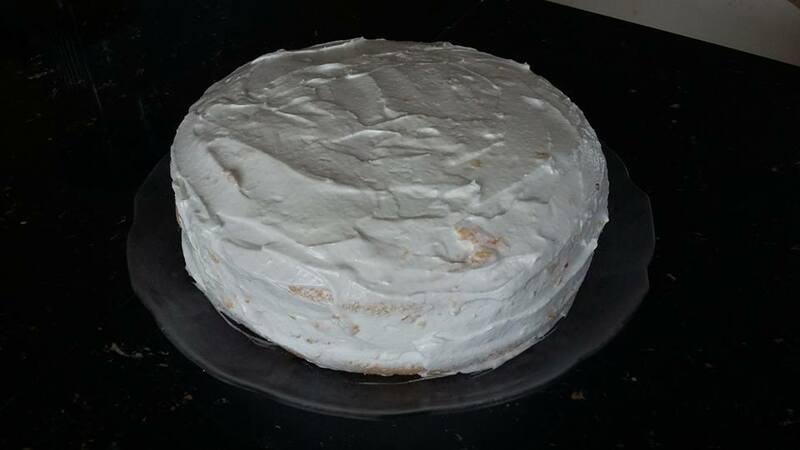 Coconut Quick-Mix Yellow Cake with Marshmallow Frosting - All #Homemade! NO #Chemicals! So I know I've built a reputation as an undomestic goddess....but I've been working to remedy that 'flaw' and so have gotten quite proficient in the kitchen, especially the baking area. If we're friends on FB, you'll often see pics of my baking during the weekend on my wall. And a couple weeks ago, I made this cake and a lot of people asked me for the recipe. Rather than blowing their eardrums off with my rambling, I decided it would be best to post the recipe with all its tips and tidbits here so everyone could have access to it. And also, I love to share whatever I have acquired as knowledge, so here goes. Other thing if you know me well - I am a huge, huge, huge proponent of the from-scratch, homemade avenue for everything, especially what we eat. Don't forget - I've had cancer twice so it's really the sensible thing for me to do to steer clear of all the chemicals and stuff they push into processed food out there. And this involves cake mixes - and is there a more ubiquitous store-bought cake mix than Yellow Cake? And then, there's the frosting. I remember when I was little, there was a White lady who lived actually just one street from where I am now based and we used to order this scrumptious, moist, and decadent cake from her all the time. I recall the frosting was something out of this world, and I hadn't tasted that in anything ever since (we're talking 25 years or something. I think she passed away around that time, coz I recall her as already being very old at the time. Think Maggie Smith-kinda old, LOL). Then one day, I was on YouTube, on the Joy of Baking channel, and I saw the woman there making Marshmallow Frosting. I think she called it 7-Minute Frosting (as in you had to beat the frosting over a bain-marie for 7 minutes using a mixer on full speed). It looked really easy...but I only own a stand mixer now and no electric beaters, and I sure don't have that much elbow grease in me to whip egg whites for 7 whole minutes at a constant high speed! So I scraped that off, thinking I wouldn't get to make that. Fast-forward and I was on French channel by this Parisian guy called Herve (pronounced Air-vay) and he was making Marshmallow Frosting (watch the vid here. It's in French but you can get the gist of it. Frosting starts at the 3.22 mark). Hope rose in me...and soared when I saw how he actually made that frosting. Easy-peasy...and I just knew I had to try this! At the same time, I recalled that cake from when I was young, and a light bulb went off in my head telling me that the frosting that little old lady used must've been Marshmallow Frosting. So on I went, and made the cake and frosted! And would you believe it - I was taken back to my very early childhood when I tasted this cake...because it tasted just like that old lady's cake! Even my husband concurred (he, too, had been ordering that cake from her when he was younger. Strangely enough, from this same spot we now live in, as this property has been his family stronghold like forever, LOL). Now a few things before I give you the recipe. 1. I don't own two same-size cake tins (I don't think I even have matching plates in my kitchen, come to think of it... Anywho...). So I have a 9-inch pan and a 10-inch one. The reason I have only 3 layers in my cake? The 9-inch cake was split in 2; the 10-inch one came out flatter and I just trimmed around the sides to make it the same size as the other 2 layers. If you have two 9-inch pans, you should be set and manage to get 4 layers when you slice them into 2. 2. I made this amount of frosting from the recipe...and it was barely enough to fill and cover the 3-layer cake. My advice - double it up (or make it in 2 batches). You can never have too much frosting in a cake! 3. I don't crumb-coat and then frost. It's gonna get eaten, anyway, so why bother? (and the blokes in my house don't eat - they wolf down or inhale food, and they certainly don't use their eyes to look at the food; it's only their taste buds and stomach that do the work here). So if you're gonna crumb-coat and then frost after 20-30 mins in the fridge, you need a double batch of frosting. 4. I very rarely use a recipe as is. I love to experiment with the numbers. Like, my husband is diabetic, and sugar tends to turn the boys into rabid monsters, so I try to cut it down as much as possible without losing flavor. And I also prefer something not too sweet, too. So the sugar in this can be cut by a third and the integrity of the cake will not be affected (they all say baking is a science that needs precise measurements and such...I've found that's pretty much BS in most cases...). As for butter, there isn't that much in here, but you can cut it by a quarter if you want. I actually prefer my cakes really buttery and soft, so I rarely tamper with that unless I discover it feels like I'm eating textured butter when the cake comes out as there is just so much in it! But this one works great with the butter measurement, so it's up to you. 2 and 1-quarter cups all-purpose flour - sifted, of course! Optional: If you're making coconut cake, have about one-third cup of grated or flaky coconut and soak it in the milk that you will have heated prior. Then allow it all to come to room temperature. I don't recommend coconut milk here as it's too thick, but this does the trick. And if you're making an almond cake, add about one-third cup of almond flour to the mix. - Grease and flour your pans. You can also use a layer of greaseproof paper on the base, but I didn't find it necessary as the cake detaches really well from the pan if it has been well greased and floured. By now, your batter should be looking pale yellow, and the sugar crystals will have dissolved. Don't worry if there's still some grainy sugar in there. - Slowly add the flour to your mixing bowl (3-4 Tablespoons at a time). When it is all in, beat it on slow/low speed for about 30 seconds, just to combine. - Add in the milk slowly (or it will all blow into your face!). And remember, your coconut is in there, too, if you're making coconut cake. - When all the milk is in, beat on High for 3 mins until the batter is really well-combined. - Pour into your prepared pans. - Let cool in pan. Invert onto rack. Let cool completely before slicing in 2. - Fill with the frosting, then decorate. Half teaspoon cream of tartar - and if you don't have it, like it's the case in Mauritius, then use the same amount of fresh-squeezed Lemon Juice. - Using a hand whisk (trust me, it does not require that much elbow grease!) or a handheld beater, whisk the mix over the heat. - Whisk until the mixture is thickened and opaque, which pretty much happens around the 5-min mark. Don't worry if it doesn't look like frosting yet - it doesn't need to at this point. - Stop once your mixture is thick and fluffy and it leaves stiff peaks in when you remove the whisk. - Let cool completely, then use to fill and frost your cake. So there you have it, peeps! It looks like there are a lot of steps, but it's really very, very easy, and the only chemical in there is baking powder, so you're safe on that front. *grin* And this cake is definitely to die for, and would make a stunning birthday cake or dessert centerpiece. Definitely best when eaten chilled, so keep it in the fridge and take it out like 10-15 mins before you'll be serving. Hope you'll enjoy! Let me know if you've tried it - yes, I want pics!